← ‘Misha’ unmasked: Mysterious friend of Boston bomber is Mikhail Allakhverdov. Dagestan Massacre video is gruesome. Six Russian conscripts are beheaded by Chechen rebels while they scream for their lives. It’s actually considered the most gruesome massacre video on the internet. Beware. Dagestan Beheading dates back to 1999. Chechen Mujahideen lead by Salautdin Temirbulatov entered Dagestan with up to 500 fully armed soldiers. There were only 13 lightly armed Russian conscripts in the village of Dagestan when the attack took place. Heavily outnumbered by Chechen terrorists, 7 of the Russian conscripts run away from the village. The remaining 6 soldiers stood up to the oppressors but quickly ran out of ammo and surrendered after being promised POW status. The Dagestan Beheading Massacre . Warning Extremely Graphic Video. Beslan school hostage crisis – Chechen rebels take 1,100 hostages including 777 children in North Ossetia, Georgia Republic in 2004. The hostage-takers were the Riyadus-Salikhin Battalion, sent by the Chechen separatist warlord Shamil Basayev, who demanded recognition of the independence of Chechnya at the UN and Russian withdrawal from Chechnya. On the third day of the standoff, Russian security forces entered the building with the use of tanks, incendiary rockets and other heavy weapons.At least 334 hostages were killed as a result of the crisis, including 186 children,with a significant number of people injured and reported missing. The second war in 1999 began with an insurgence of Chechen rebels into Dagestan, with the aim of freeing their Muslim brothers from occupation by infidels. The Islamisation of the conflict opened up a fierce sectarian fight between Sufism, a traditional form of Islam based on local customs, and Salafism, a more radical form that promotes sharia law. 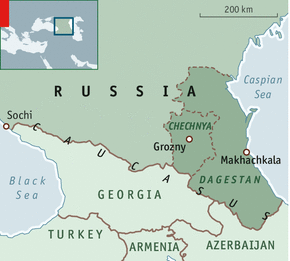 In Chechnya Sufi leaders sided with the Russian state to eradicate Salafism. After the 2003 assassination of his father Akhmad, Ramzan Kadyrov, his son and successor as Chechnya’s president, redoubled these efforts, hunting down Salafists and enforcing Sufism as a state ideology. Chechnya now boasts Europe’s largest mosque, women are covered and polygamy is encouraged. But even as Mr Kadyrov has “pacified” it, violence has spread, including to Dagestan, where the Tsarnaev brothers lived before going to America.